View cart “SingSmart QuickStart” has been added to your cart. If you have always wanted a FAST, FUN, EASY and AFFORDABLE way to LEARN TO SING BETTER, you have finally come to the right place! These singing lessons are so simple and straight forward that EVERYONE loves them. Plus it comes in so many formats, that no matter how you prefer to learn, it’s got you covered. And…with the exception of deciding whether you want immediate access (online console with download privileges) or get shipped a hard copy, you get access to multiple formats with your order. 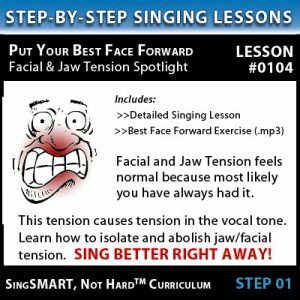 This fun vocal training exercise takes you from breathing to full scales in a contemporary fashion that is sure to lift mental attitude as well. The exercise is provided onscreen for computer use but is also provided as an .mp3 for you to save to CD or your player for warmups away from your computer! See how the piano keyboard, music notes on a grand staff and voice ranges all tie together in this simple, yet informative diagram. Valuable reference for determining written notes on music, as well as where they fall on the piano keyboard. Studio singers that don’t know how to read music find this diagram extremely helpful in on-site recording situations. Adult Beginner Singers and Working Singers with no singing lesson experience will find AFFORDABLE SINGING LESSONS easy to use right from the get go! With its simple instructions and lack of extra fluff, you get JUST the RIGHT AMOUNT of information without being bogged down by too many details. Learn vocal tips and singing secrets you absolutely must understand to become a great singer and find your voice. Along with learning the very foundations of singing well, you can also jump right ahead of many more advanced singers by learning how to read music, understanding key signatures and the basics of music theory. The included vocal exercise routine, The Fast & Funky Vocal Warmup (8.5 Minutes) is a perfect daily routine to warm-up your voice and improve your vocal skills. If you are a beginner and not sure…remember, it takes REPETITION of specific actions to achieve balanced vocal coordination. Since beginners and kid singers are not really known for focusing on long extended warm-up routines….the FAST and FUNKY ROUTINE is PERFECT to get you headed in the right direction. Vocal exercise is a term that sounds daunting but the included vocal exercise routine makes it both EASY and FUN! There are two interactive singing lessons softwares included with the Affordable Singing Lessons course – one designed for kids and one designed for adults. Use one or use them both! Kids left to their own devices love the interactive singing lessons software and can easily follow the 8.5 minute Fast & Funky Vocal Exercise Routine. Keep kids from screaming and destroying their voices by giving them the power to find their own voice. Teachers everywhere love the AFFORDABLE SINGING LESSONS course for so many reasons. This jam packed course provides a simple straight-forward lesson plan for classes focusing on teaching singing. Apply and focus as much as you can on the new concept during your class performance practice. Each concept will build a good vocal instrument foundation throughout your training, when you get to the end…start over again. The singing skill presented will increase with each lesson repetition! It’s that easy. Teachers of YOUNG CHILDREN particularly enjoy this course as a healthy way to begin kids singing instead of “screaming”. The Lesson Plan can easily be followed for appropriate age comprehension and the Fast & Funky Group Activity is always a big hit. Teachers looking for DETAILED singing lessons or more comprehensive class voice plans for older students, please visit You Can Sing with Impact and Singing Is Easy for many additional options. Scroll up and click ADD to CART.